When I recently got this question from a future expat, I penned out a quick response without much thought. It wasn’t that hard to select 10 must visit places in SA, to be honest, because in our two years there we hadn’t really been to any MORE than 10 places. Much of our travels took us OUTSIDE of South Africa – Mozambique, Victoria Falls, Mauritius, Zanzibar, Kilimanjaro, Namibia, Botswana; all of them must-visit places in their own right, I’d say – which left me straining to even come up with ten places we’d seen within the country. The Mother City is a must-visit place, if you don’t already live there, and likely a place you’ll return to many times. What we liked about Cape Town was its affordability. In a country where you will leave a LOT of money at too many pricey luxury safari lodges, Cape Town is a welcome surprise for family travel. 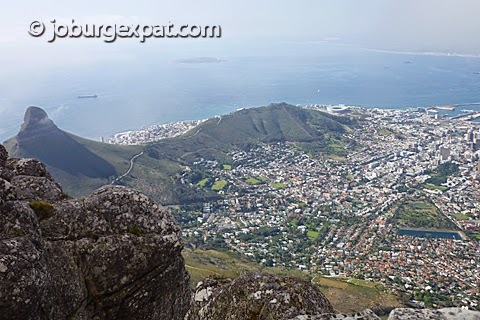 There’s so much to see and do: The V&A Waterfront, Table Mountain, a tour of Robben Island and Nelson Mandela’s prison cell, a day trip around the Cape Peninsula with a stop at Boulders for the penguin colony and culminating in a photo op at the Cape of Good Hope, and too many world-class restaurants to mention. Start by reading Getaway to Cape Town for some travel tips, or if you’re traveling with children, read my Cape Town with Kids series. If you have time to venture out farther, add some adventure by going cage diving with great white sharks in Gansbaai, and stop for some whale watching in Hermanus along the way. time again. First, it’s close to Joburg. Second, it’s malaria-free. And third, it has some of the world’s best safari lodges and game viewing, in my opinion. All of the Big Five are represented, and it is one of the best places to see the resurging but still endangered African wild dogs. To get an idea of what awaits you on a family safari at one of its luxury lodges, start with In Pursuit of the Buffalo, which takes place at Jaci’s Tree Lodge. We’ve also stayed at Mosetlha Bush Camp (a more basic yet very cool eco lodge) and Tau Game Lodge, and all experiences were wonderful. You can’t really go wrong at any of Madikwe’s lodges, so it might be a good idea to look for special offers any of them might have at any time. We didn’t get to see the spectacular Drakensberg until the very end of our stay in South Africa. I’m glad we got to fit it in, but would have liked to spend more time there. Our oldest son got to hike in the Drakensberg as part of Dainfern College’s Enyuka Challenge, a 10-day hiking tour carrying their own tents and cooking their own food, and I would have liked to do something similar with our family (though I’m sure the girls would have complained every step of the way). The scenery is gorgeous, especially in the summer months when the grass turns green, and the grandeur and ruggedness of the jagged peaks around you doesn’t fail to leave a profound impression on your soul. 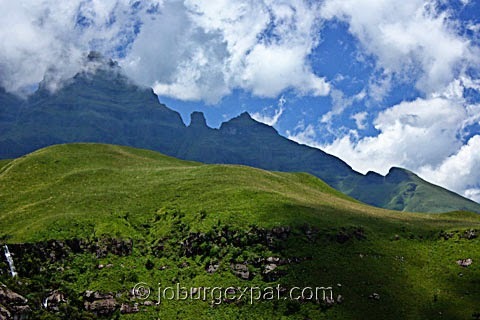 Read Drakensberg for more pictures and a hotel tip. The Orange River forms the border between South Africa and Namibia in the far northwestern corner of South Africa (which, I’m always surprised when looking it a map, is actually to the south of Johannesburg) in what’s called Namaqualand. 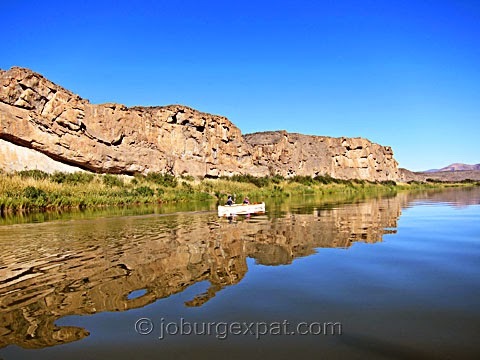 One of our most memorable experiences was taking a rafting trip on the Orange River. You can pick any distance from one to five days, during which you and your guide paddle on the river during the day and camp on the banks at night. As always in Africa, you will be pampered with great meals magicked up amidst the wilderness. We did it through Felix Unite, but there are other providers as well. While you’re in the vicinity, you might also want to check out the Richtersveld National Park and Fish River Canyon. I haven’t blogged about the Orange River yet, as that will be part of my new book coming up, but Road Trip to Namaqualand will give you an impression of the general area. 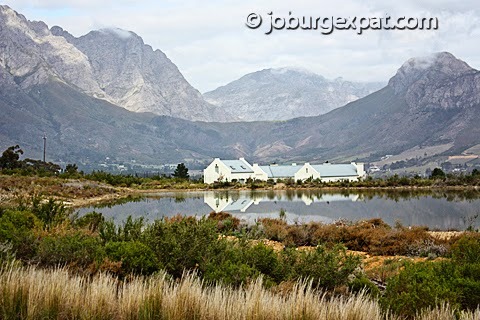 Even though Franschhoek is near Cape Town and can easily be combined with #1 on this list, it deserves its own category, because you are guaranteed to want to come back many times once you’ve seen it. To me, it is an idyll I could easily imagine retiring to. Beautiful mountainous landscapes, secluded yet not remote, nice climate, great restaurants, home to nice art galleries – the list of selling points is long. Number one on that list, of course, is the wine. Franschhoek is the heart of South Africa’s wine country (in addition to nearby Stellenbosch, but in my mind Franschhoek is more beautiful) and you can spend days, if not weeks, hopping from one winery to the other, each more beautifully set into the hillside than the last, and taste wine and eat gourmet food to your heart’s content. Read the aptly named post I’ve Fallen in Love to get started. I still maintain that Madikwe tops Kruger Park as a safari destination, especially coming from Joburg, but Kruger Park is of course worth its own visit. Some say that leopards are especially abundant there, so if that puzzle piece of the Big Five has still eluded you, then Kruger Park or any of the adjacent private game reserves such as Sabi Sands or Timbavati might be your answer. 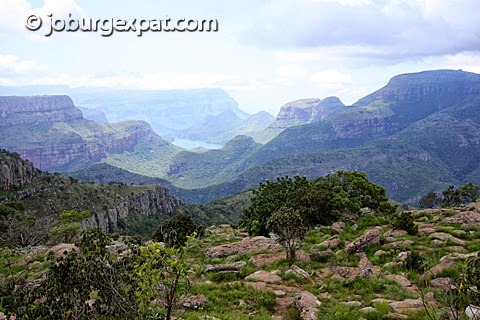 Along the way, if you get a chance, make a trip through the Blyde River Canyon (image on left) – its beautiful. Just be sure to take appropriate malaria medication depending on the time of year. I admit we never quite made it to Kruger Park proper, but we had a fabulous stay in Klaserie Game Reserve. Start with Stalking the Elusive Leopard in which you get to see pictures of beautiful Kitara Camp before it was swept away in a flood just a few weeks later. The Garden Route is the area along South Africa’s southern Coast to the east of Cape Town, encompassing the cities of Mossel Bay, George, Plettenberg Bay, and Knysna, all the way to Tsitsikamma National Park and Storms River. There are tons of fun things to do along the Garden Route, and the scenery is beautiful every direction you go. We visited Knysna only briefly but immediately fell in love and would have returned if we had stayed in South Africa longer. 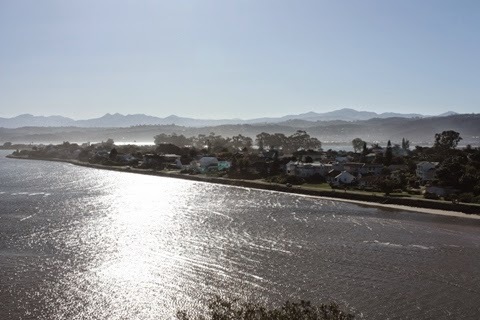 It’s a picturesque town set against the breathtaking views of the Knysna Heads with lots of things to do, such as whale watching and a plethora of watersports, plus it has great art galleries and restaurants. Also worth exploring are Wilderness near George and Tsitsikamma National Park, where we partook in a Canopy Tour. Plettenberg Bay has a beautiful beach and is a favorite South African summer destination during the Christmas holidays. If you feel adventurous, add bungy jumping off the Bloukrans Bridge to your list. We didn’t make it to Durban – South Africa’s third-largest city – until 2 years into our stay in South Africa, which sounds a bit weird, but that’s Durban for you. It just doesn’t get the attention, but is definitely worth a visit. Spend a day at uShaka Marine World if you’re into aquariums and water parks, take a stroll along the beach promenade for some colorful people viewing and, not least, the spectacular sand sculptures, and if you can at all manage it, spend a few nights at the nearby Oyster Box Hotel in Umhlanga Rocks just north of Durban. It’s a one-of-a-kind retro-colonial experience, the views of the lighthouse from the Ocean Terrace are stunning, and you might enjoy hanging out on those beautiful sandy beaches and braving the impressive surf. The Indian Ocean is actually warm, welcome news if you’ve ever dipped so much as a toe into the icy waters off Cape Town. 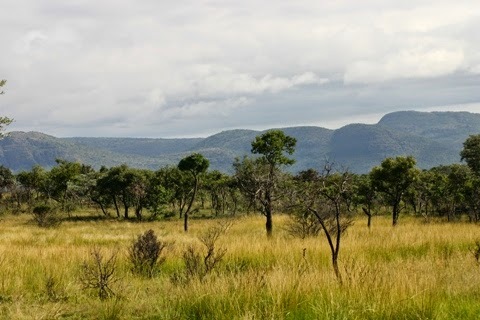 Our very first South African safari took us to the Waterberg, only about 2.5 hours from Johannesburg, and that area will always hold a special place in our hearts. Where we stayed that time was not Big Five territory, but we found it lovely all the same. We gazed at zebras, wildebeest, and giraffes to our heart’s content, we tracked the two resident rhinos at Yellow Wood Game Lodge numerous times, we swam in a lovely rock pool – okay, my family swam, and I watched, as it was freezing – and we had more than a little excitement getting stuck in the mud on an uncomfortably steep mountain slope. 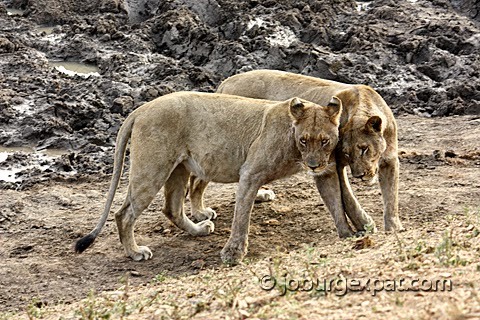 If you do hanker for the Big Five, check out Welgevonden Game Reserve, where I can highly recommend Jamila Lodge. If you take a look at my wildlife photo album from there (scroll to the bottom for the slide show), you’ll agree that the sightings were pretty cool! We hadn’t even quite settled into our new house and gotten acquainted with Johannesburg, when we were already invited to join another family – who would go on to become our best friends – on a scuba diving trip at Sodwana Bay, which is on the Indian Ocean just South of the border to Mozambique and Ponta do Ouro. It’s one of the world’s top diving destinations and the boys got quite spoiled to experience it right at the start of their diving careers. 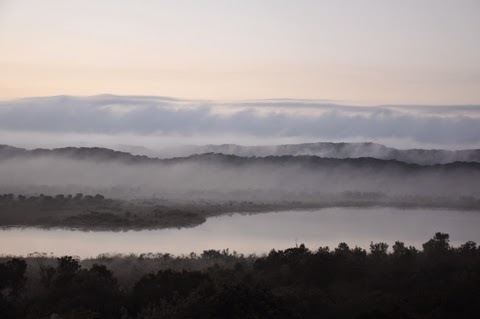 Sodwana Bay is part of the greater St. Lucia Wetlands, one of South Africa’s biggest nature reserves. We also spent some time canoeing among hippos in Hluhluwe Game Reserve about an hour inland from there, where we were also served a glorious 5-star meal in the middle of the bush (which would have been even nicer had it not been absolutely freezing that winter night). (Photo courtesy of Jacky du Plessis). There we go, that’s my Top 10. What’s missing, of course, is Johannesburg itself, because for us that was home, not a travel destination. However, Joburg has a ton of things going for it, which you can read all about in What to Do in Joburg. I’m sure some of you will disagree with the above list, as there are so many more beautiful South African destinations. I’d love to hear about them, so please leave a comment! Previous PostPrevious A Man With a Sack, Some Old Boots, and a Naked Baby: Merry Crazy Christmas!